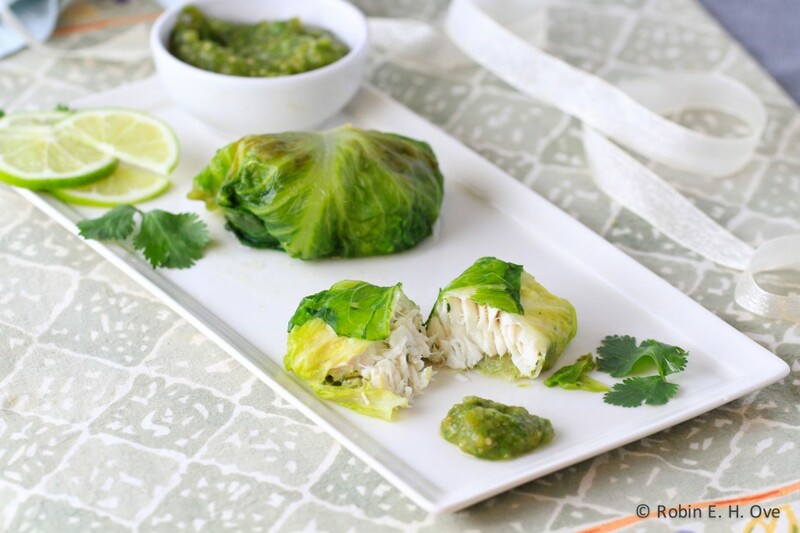 Lettuce-wrapped Halibut with Spinach Salsa Verde - What about the food? Maybe it just being a Pisces, or having been born near the ocean makes me crave the salt sea air — and seafood. When given the choice it really comes down to what is fresh and in season, lessons learned from my father, from his father. 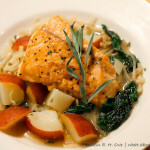 Red snapper, crab, albacore, trout, squid, and clams all made their way to our family’s seasonal table and while we were not “fish on Friday” practitioners, we had fish nearly every week in some shape or form. During the Depression, my granddad would fill in his jobs at the lumber mills by heading out to sea with the local fisherman who welcomed an extra hand on deck. The reward was his share of the catch, feeding the seven children through tough times. Each of the boys learned to hunt and fish to sustain the family, to garden, to mend and repair. It all became part of their being, their generation that knew how to make do, but make do well. In better days, the routines and muscle memory of these activities turned into recreation, reliving memories and renewing a sense of purpose. The origins of local, self-sufficiency, sustainability. It is this tradition, in part that makes me so happy to support my local fisherman and fishery on the central coast. Each Tuesday begins in anticipation, what will they bring in today? Just knowing that our halibut this week was caught by Mike on the Linda Noelle, landed in San Francisco and quickly filleted by Greg for our share makes me appreciate the catch and the meal all the more. Tonight is another on of my cultural mixups combining an Asian inspired lettuce wrap with fresh spinach salsa. Beautiful and tasty. 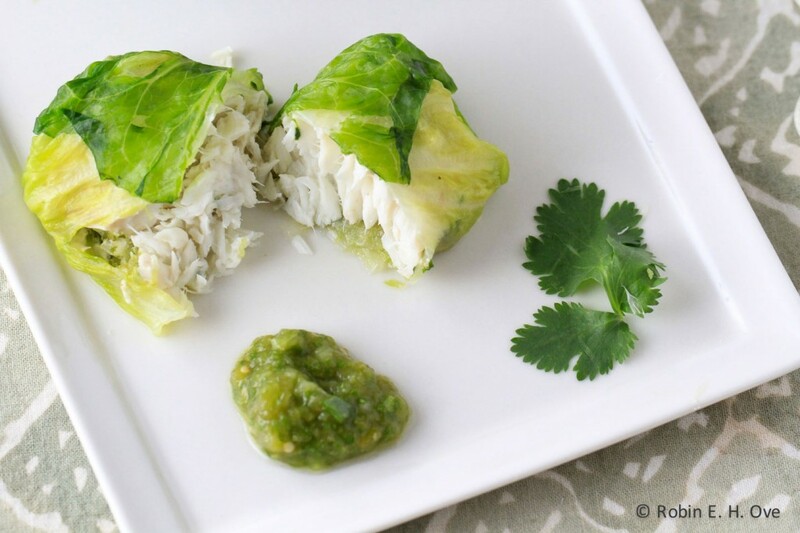 Quickly steamed and full of flavor these halibut packets combine the elegance of a lettuce wrap and punch of a healthy spinach salsa verde. You will need a steamer rack to steam the fish packets. Clean the large outside lettuce leaves, trim out the center rib just where it begins to thin to the thick bottom in a V cut. You will need at least 1 large leaf for each fish piece, perhaps two. Blanch lettuce leaves in boiling water for about 30 seconds, this will just soften them for wrapping. Remove from hot water, place in a cold ice bath to stop the cooking and then dry on paper towels until you are ready to wrap. Prepare salsa ahead of time to allow flavors to blend together. 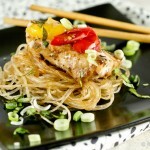 Just add ingredients into the bowl of a food processor and run for 30 seconds to blend to a thick consistency. Pulse a few times more until it suits you. Chill. Cut fish into 1” x 2” chunks (approximately) You could do larger pieces but you will need to layer your lettuce leaves to cover fully. Lay each fish piece on the bottom of the lettuce leaves (push the open gap from the rib removal together. Sprinkle the fish with a bit of Sea Salt and add a teaspoon of the Spinach Salsa. Fold the sides in then roll up finishing with the top of the leaf. Add the Sake and Liquid Smoke to the boiling water in your steamer, place your steamer rack over water and layer the fish pieces, lettuce seam down. Steam for 10 minutes. Remove from steamer and serve with additional Spinach Salsa Verde. 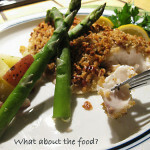 Thanks to my membership in Local Catch Monterey Bay for making “Fish on Tuesday” such a treat. 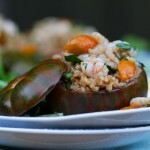 Such piscene delicacy–a perfect summer evening repast! Indeed, something fishy going on here. What a beautiful meal, Robin! And they always say – and I wish I could – that you should know the name of the person who grew or caught your food. Bravo to you! When we used to vacation out in Brest in Brittany we would love to go at 5 every afternoon to the dock and buy seafood, crab, and shrimp and such right off the boat. 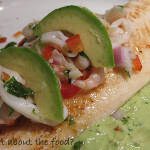 This is a great recipe and the salsa sounds perfect for fish – flavorful and tangy and bright! We don’t always get that chance, to know who is providing for us. But when we do, and when we can it is cause for celebration and sharing the good news! My Dad used to go down to the harbor and pick up a little something off the boats too. We are blessed to be on the ocean Jamie.